With the crispness of fall in the air, the Pioneer Museum in Fredericksburg is opening its gates for Log Cabin Days – Living History, a special event where families can experience life on the frontier, on Saturday, Oct 9, from 10 a.m. to 4 p.m. 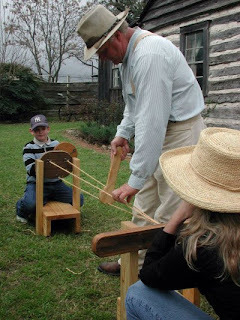 Kids can take a turn at making rope, churning butter, grinding corn, and spinning wool. Demonstrators will show how to wash with a scrub board, weave pots, create “seed art,” and perform other household and homestead chores. Throughout the day, visitors can explore the Pioneer Museum’s entire 3.5-acre site. Features include one of the first stores in Fredericksburg, a smokehouse, blacksmith shop, one-room schoolhouse, and an original Sunday House. All Living History activities are included in the regular museum admission – $5 for adults, $3 for children. The Pioneer Museum is located in downtown Fredericksburg at the corner of Main Street and Milam Street. The Gillespie County Historical Society, a 501(c)(3) nonprofit organization whose mission is to preserve historic sites and objects in Gillespie County, while promoting interest in Texas history. For more information, call (830) 997-2835.